Moe also wanted to show why the gods weren't really in control. To show that there weren't really any gods at all. The gods were just forces of Nature, made to act like people so that those same people could relate to them. Why, he asked his readers, didn't the gods remain constant? The idea of a lightning bolt or a harvest didn't change, so why did the god? The father of the gods, Anu, was a father in every sense of the word: he came from parents -- Anshar and Kihsar -- and in turn fathered children who would take over from him. He was fast becoming a grandfather, old and weak. A shadow of his former self, almost a ghost. This chart is excerpted from the larger chart on "Anu" in Wikipedia. Gilgames (bottom right-hand corner) refers to the demi-god Gilgamesh, king of Uruk and hero of the Epic of Gilgamesh. 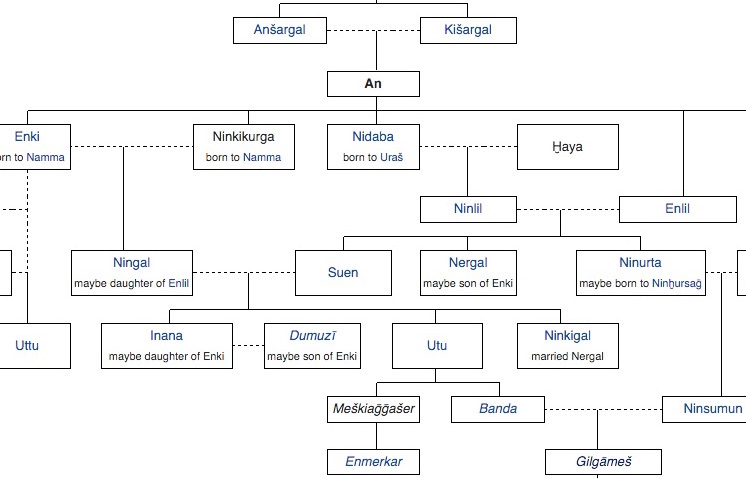 This chart helps to see how two Trinities developed, the first composed of 1) Anu (the father of the gods), 2) Ea (the god of wisdom and fresh water), and 3) Enlil (the high god, later replaced by Marduk), and the second composed of 1) Shamash (god of the sun), 2) Erishkigal (goddess of the underworld), and 3) Ishtar (goddess of love and war). From http://www.gods-heroes-myth.com/trees.html. From the look of things, Enlil seemed to be running the show now. Yet the sun-god Shamash kept challenging his leadership. And Enki -- god of the underground waters, also known as Ea -- connived with humans behind Enlil’s back. When Enlil decided to exterminate the noisy humans from the face of the earth, it was Ea who whispered to Utnapishtim to build a boat and put the animals inside. It was Ea who saved humanity from the Great Flood. And yet Enlil was supposed to be in charge? One group, the Unitarians, combined Anu, Enlil, and Ea into one Higher Principle, which they called The Trinity. For them, Anu became a faded, background figure, a sort of Holy Ghost. The Unitarians had a big row with the Trinitarians, yet as far as Moe could see they both wanted the same thing: to make 3 = 1, or 1= 3, depending on which way you read the equation. Moe liked the first version of the equation, 3 = 1, but he couldn't help worrying about the math. The notion of creating a Higher Principle or Supreme God appealed to Moe, especially since his family had always believed that their god was the One True God and that all other gods ought to bow down before Him. But the (already shaky) concept that 3 = 1 (or 1 = 3) took a hit when Marduk came along. Marduk not only usurped Enlil's place in the Trinity; he also made a bid to become the highest god. The only God. Bêl Bêlim, Lord of Lords. Muballit Mîte, Reviver of the Dead. Moe liked this idea, but he wanted to push it further. Why not get rid of the other two? Why not get rid of them all? Why not assert that they never existed in the first place? Yet to do this he would have to go back again to the beginning. He would have to get around the slipperiest of problems, the one that went back to the dawn of creation, to the primordial Chaos. Like Marduk, he would have to do battle with the incarnation of Chaos, the sea-monster Tiamat. But his victory would have to be so complete that this incarnation would never become a reincarnation. Worms, serpents, dragons, one lead to the next, and all of them were trouble. But was Chaos really the very beginning of things? Or was Order? And if it was Order, why were the gods continually fighting chaos? And why did they always succumbed to chaos, entropy, the next generation? Moe called this the serpent's curse, after the final chapter in Gilgamesh (where the serpent steals the plant which would have given Gilgamesh eternal life). The problem was this: Marduk was the son of Ea, and Marduk too had a son, Nabu. How could he be a Supreme God if he wasn't a god before he was born, and if he had a child who would take over one day? It was all fine and dandy to say that Marduk slew Tiamat, the primordial monster of Chaos, yet what if Marduk died and the chaos came back? How were his people to believe in gods who intrigued behind each other’s backs, and who eventually lost their powers? The snake not only denied eternal life to the demi-god Gilgamesh (and to the old men of Uruk who Gilgamesh intended to share the plant with). The snake also severed the possibility of eternal life on a deep psychological level. How could people believe in eternal gods when they believed that they themselves would never reach eternity? If Moe was right that they only created gods in their own image, then they could only create gods who were born, lived, and lost their power. They needed a God who created man in His image, not the other way around. The only one who managed to grasp eternity in their system was the snake, who stole the magic plant and who sloughed off one skin and emerged into the next. Gilgamesh, like his subjects, was left empty-handed. Moe was going to change all that. In Moe’s story his One True God had all the power. And the glory. He always did and he always would. Forever and ever, amen. The Snake might try to scheme his way into the lush apple garden of eternity, but he would be pre-empted and outflanked. Finally, he would be crushed beneath the heel of the Almighty. Snakes, whales, dragons, he'd crush them all. Destruction of Leviathan, Gustave Doré, 1864. Also from Wikipedia ("Leviathan"): "Sea serpents figure prominently in the mythology of the Ancient Near East. They are attested by the 3rd millennium BCE in Sumerian iconography depicting the god Ninurta overcoming a seven-headed serpent. It was common for Near Eastern religions to include a Chaoskampf: a cosmic battle between a sea monster representing the forces of chaos and a creator god or culture hero who imposes order by force." In Moe's story, there were no primordial chaos, no intermediary worlds. No more theogonies and palace coups. No more guessing who was in charge. No more gods. His One True God would crush anyone who even secretly thought their god was worth sacrificing a chicken to. His One True God would crush all the other gods and merchants. And He would hurl the Indian yogis into a fiery pit. After he chiseled these words into the fresh clay, Moe wondered if his readers might find this a bit harsh, especially in a cosmopolitan, multi-cult city like Babylon. What, for instance would Deepika think of it? Deepika, Shesha’s daughter. Deepika, with her thick, coal black hair, and her dark eyes, shiny as glass. But surely Moe wasn't expected to work out all the details. If anyone wanted to edit his tablets in the future, they could say all sorts of nice things about Indian girls. The important thing was to explain how unworkable it was to have eternal gods who lost their powers. If he could take a shot at the foreign apple merchants in the process, so much the better. He had nothing against Deepika.